Without treatment, more than 40 percent of precancerous breast lesions could develop into invasive breast cancer. But what if scientists could more accurately predict which lesions are likely to become cancerous, or better yet, provide women a way to prevent the lesions from forming in the first place? Dr. Gang Ren, graduate student in the Department of Mathematics and Statistics; Matthew Bommarito, research technician; and Joshua Letson and Yashna Walia, graduate research assistants. Dr. Saori Furuta, assistant professor in the Department of Cancer Biology, believes that might be within reach. Furuta has spent years exploring the role nitric oxide plays in the development of precancerous lesions. Nitric oxide is a signaling molecule produced throughout the body, and abnormal levels of it in mammary cells has been implicated in the formation of early-stage cancer. Now Furuta is investigating how nitric oxide, in its proper concentration, can suppress tumors from forming, and whether its abnormal concentrations might be able to be used as a biomarker that identifies women with or at risk of developing early-stage cancer. Furuta’s research is being funded by a multi-year $795,000 research grant from the American Cancer Society. The study was one of 74 funded earlier this year by the American Cancer Society across the United States. Furuta has already examined the link between abnormal — too high or too low — levels of nitric oxide and mammary tumor formation. This research will take that prior work a step further by investigating the mechanisms by which a normal level serves to protect breast cells. 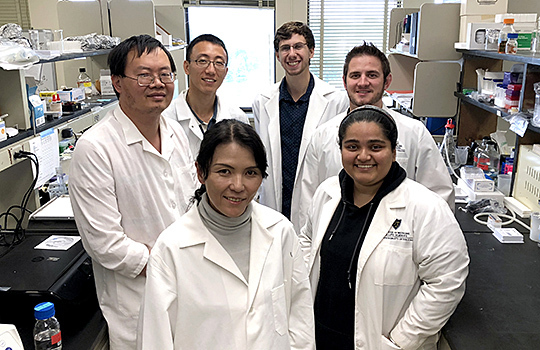 To do that, Furuta’s lab will use a mouse model in which tumor-promoting genes have been altered so they would not be affected by nitric oxide. Researchers will be able to test whether those specific genes produce mammary tumors, similar to how they do when nitric oxide levels are abnormal. Lab tests also will be conducted on normal human breast tissue, as well as tissue from different stages of cancer to determine how the level of nitric oxide changes as cancer develops and progresses. The grant from the American Cancer Society was preceded by an anonymous $50,000 gift from one of the members of The University of Toledo Medical Research Society to begin preliminary research. This entry was posted on Wednesday, February 13th, 2019 at 3:54 am and is filed under Medicine and Life Sciences, News, Research, UToday .